Posted on 24/07/2011 by Trần Phước Hùng	| Bạn nghĩ gì về bài viết này? Heapsort algorithm is a comparison-based sorting algorithm. The heap sort works as its name suggests. It begins by building a heap out of the data set, and then removing the largest item and placing it at the end of the sorted array. After removing the largest item, it reconstructs the heap, removes the largest remaining item, and places it in the next open position from the end of the sorted array. This is repeated until there are no items left in the heap and the sorted array is full. Elementary implementations require two arrays – one to hold the heap and the other to hold the sorted elements. Heapsort inserts the input list elements into a heap data structure. The largest value (in a max-heap) or the smallest value (in a min-heap) are extracted until none remain, the values having been extracted in sorted order. The heap’s invariant is preserved after each extraction, so the only cost is that of extraction. Heapsort uses two heap operations: insertion and root deletion. Each extraction places an element in the last empty location of the array. The remaining prefix of the array stores the unsorted elements. 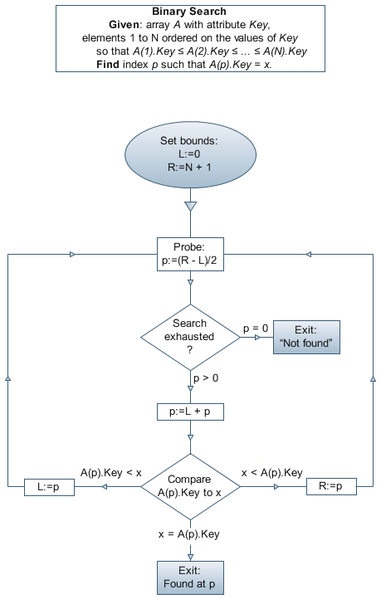 Binary search is an algorithm for finding the location of an element in a sorted list. First, it checks the middle element of the sort list; if that element is equal to the sought value then the location has been found; Othewise, the lower half or upper half is chosen for next searching based on the sought value less than or greater than the middle element. By doing so, this binary search reduces the number of elements to be checked by a factor of two each time searching and find the element in logarithmic time. Binary Search implemented in C.
Binary Search in using recursion technique. Bubble sorting is a simple sorting technique in sorting algorithm. In bubble sorting algorithm, we arrange the elements of the list by forming pairs of adjacent elements. It means we repeatedly step through the list which we want to sort, compare two items at a time and swap them if they are not in the right order. Another way to visualize the bubble sort algorithm is as its name, the smaller element bubble to the top. Here is the source code implements bubble sorting algorithm in C which sorts an unordered list of integer.